Deputy Chief Minister Chowna Mein who is also the Minister of Finance & Planning in his speech at State Development Council 2016-17 informed that the plan size for the current financial year is Rs. 6569 Crores. However, allocation under Normal Development Activities for various departments under Plan allocation has been finalized at Rs. 1459.88. He informed that the major chunks of plan size has been break up for funding state share of Centrally Sponsored Schemes, Negotiated loan, SIDF and for completion of projects of State importance which are incomplete due to delinking of JNNURM, SPA or cost overruns. He appealed to exercise financial prudence while placing the proposals by various departments and called for judicious use of the State’s financial resources due to meagre resources. He informed that though the 14th Finance Commission recommendations were very encouraging for the state but the actual remuneration of Share of Central tax by Finance Ministry has not been as per the recommendation and there is gap of Rs. 2240 Crores between the recommendations and actual realization for the last financial year and current financial year. He said such a huge gap has certainly had an adverse impact on the Planning process of a resource crunched State like ours. However, he informed that the Chief Minister has taken up the matter with the Prime Minister and Union Finance Minster and hoping of a fruitful outcome. He also said that the State’s Share of Central taxes will be largely utilized for meeting up the additional fund requirement for implementation of 7th Pay Commission recommendation which will cause 23.55% increase in overall emoluments for employees which is going to make a huge financial impact on our State’s resources thereby leaving very limited resources for Capital investments. While observing that the spatial distribution of development activities by various departments have not been equal across the state in the successive AOP/SADA, the State Government decided to have an ‘Assembly Constituency centric approach’ for development and therefore, Rs. 10 Crores was allocated for development of each assembly constituency to ensure balanced development across Arunachal Pradesh. He said that the State Govt is committed to provide matching State share against the centrally sponsored schemes and therefore, has kept adequate provision for the same. We have already released Rs. 62 Crores as state share and another Rs 40 Crores will be released soon. He further informed the State Government has taken a bold initiative towards e-governance and the Department of IT & Communication in collaboration with the National Informatics Centre and making efforts to put our State as one of the forerunners in the Country. “This will not only improve efficiency but will also bring governance closer to the people and make it more transparent” he added. He also informed that to make the disbursement of stipends hassle free for the students, all stipends and other scholarships provided by the State Government will be brought under the ambit of Direct Benefit Transfer. This will also enable us to avoid duplicity and pilferage of public money. However, he reiterated that the Health & Education are priority sectors and the State Government is making all efforts to strengthen them and informed that the State Government proposes to conduct an independent study to analyse the activities under SSA, NRHM and ICDS so that corrective actions can be taken by the Government. Emphasizing on connectivity of border area, he informed that the State Government is constantly pursuing with the Govt of India for special package to strengthen the basic infrastructures in border areas and proposals for a special package in the sectors of Health, Education, Power, Food & Civil Supplies and Drinking water has already been submitted to Government of India. The proposal is being monitored and coordinated by Ministry of Home Affairs, Government of India. He also underscored the importance of effective monitoring citing that it is critical for successful implementation of projects and judicious use of funds and called to make monitoring a bed rock of management. He called upon all the Cabinet Colleagues, Commissioners and Secretaries to conduct regular monitoring of all the State Plan schemes, program and Policies. He also asked all departments to prepare and maintain an Inventory of Assets and submitted to the Planning department which will be uploaded on the website of Planning department and help in effective monitoring. He also called to rationalize Chief Minister’s Flagship schemes and to keep its flag flying and urge upon all the Cabinet Colleagues, Commissioners and Secretaries to implement the CM flag ship schemes effectively. While sternly calling for execution and completion of projects in a time bound manner, he underline that no work should be executed without observing codal formalities as laid down by General Financial Rules (GFR), CVC guidelines and CPWD manual. 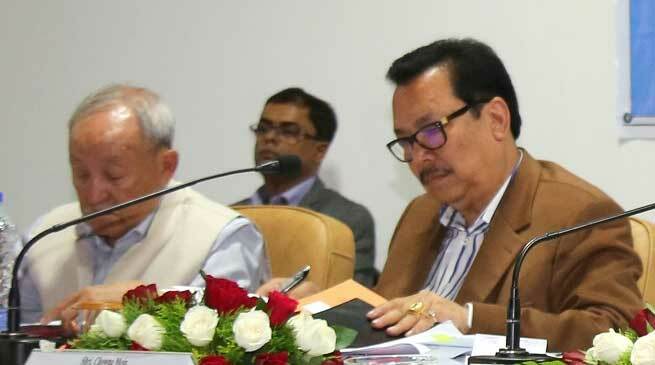 Stressing on timely submission of Quaterly Progress Reports, Utilization Certificates and Completion Certificates, DCM informed that Government of India has taken a serious note on the delay in submission of QPR, UCs and CCs by Government of Arunachal with regards to Centrally Sponsored Scheme which has led to undue delay in the release of subsequent instalments adversely affecting the progress of several projects. He called upon the Commissioners and Secretaries to utilize the online portal as many line Ministries have already opened their online portals for submission of QPR, UC and CC and to upload all required documents online. He also informed that Planning department will release Rs. 6 Cr to concerned DCs for establishment of Drug de-addiction centres in various districts.